There is nothing better than an ice cold glass of orange juice on a Saturday morning with my favorite breakfast!! Lately, my family has been quenching their thirst with Uncle Matt's organic juices and we love every gulp!! And even better news is that they recently just introduced Uncle Matt’s NEW Blends with Benefits probiotic-infused orange juices! You can drink them as a healthy drink or add them into mouth-watering recipes, either way you’ll want to try them! Uncle’s Matt’s Organic, the nation’s original organic orange juice company adds a functional boost of probiotics and turmeric to orange juice with New! Reduced-Calorie Orange Coconut and New! Organic Orange Turmeric! Uncle Matt’s Organic Orange Turmeric and Orange Coconut juices contain the probiotic GanedenBC30, which contains over 1 billion CFUs per 8oz serving. GanedenBC30, which is also in the leading brand of kombucha, supports a healthy digestive and immune system and has over 20 peer-reviewed clinical studies. MegaFoodTM, a leading whole food supplement producer, and Uncle Matt’s, are continuing their synergy with the addition of MegaFood’s organic Hawaiian turmeric as Uncle Matt’s turmeric source. With over 500mg of farm fresh turmeric per 8oz serving, you can now drink your daily dose. Turmeric has been used in Asia for thousands of years for its health benefits. Uncle Matt’s Orange Turmeric also contains 120% of the RDV for Vitamin C.
Uncle Matt’s reduced calorie Orange Coconut also contains GanedenBC30 patented probiotics with only 70 calories per serving, which is 36% less calories than regular orange juice and 40% less fruit sugar. Uncle Matt’s Orange Coconut also contains B Vitamins and boasts natural electrolytes and Vitamin C.
Offered in family-friendly BPA-free 59 oz. packaging, Uncle Matt’s new juices are gluten-free and have no added ingredients, flavors, or preservatives. And as with all of Uncle Matt’s products, each is grown and produced without the use of GMOs or synthetic pesticides or fertilizers. Uncle Matt’s juices will be available in select Whole Foods and Kroger stores nationwide. 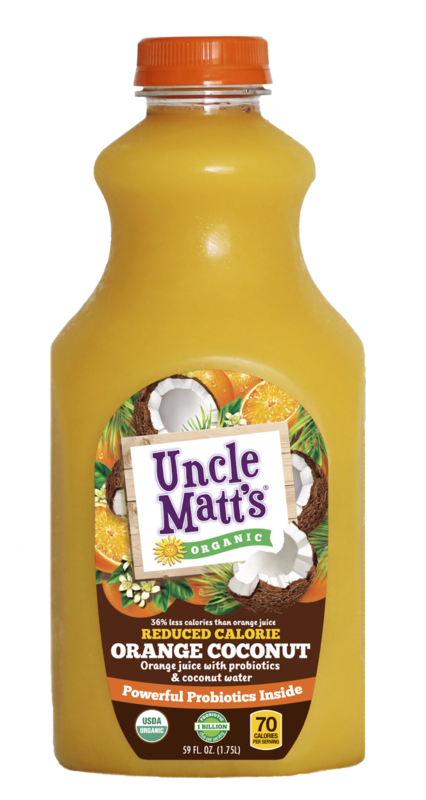 And ALL Uncle Matt’s new juices are gluten-free and have no added ingredients, or preservatives. Since 1999, Uncle Matt’s has been using only premium 100% organically grown fruit that is free from synthetic fertilizers and pesticides. 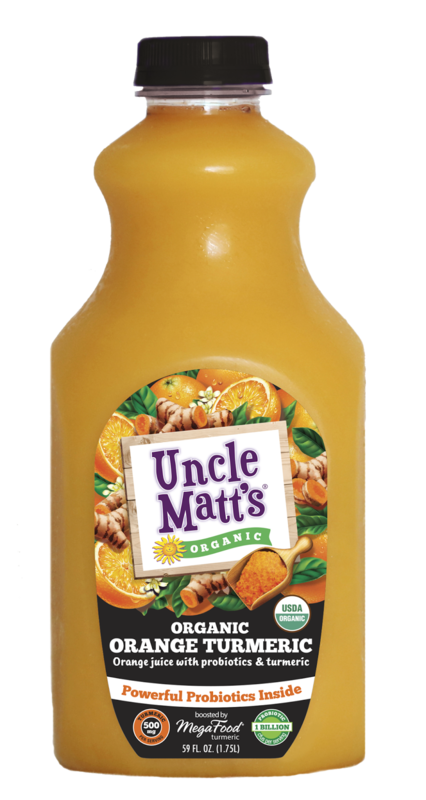 You can purchase these new Uncle Matt’s organic juices in select Whole Foods and Kroger stores nationwide.